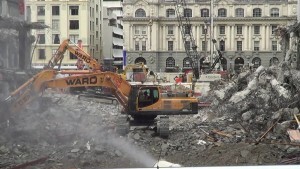 One of New Zealand’s biggest building projects in recent years turned downtown Auckland into a giant demolition site as wrecking crews erased 15,000m2 of retail space in less than six months. The clearing of the 70-shop, three-level Downtown Shopping Centre to make way for Precinct’s $850 million Commercial Bay development was, for the thousands of Aucklanders who passed the site each morning on the way to work, a rare spectacle to behold. Elsewhere in Auckland, wrecking crews have been cleaning up the Hobson Street site of SkyCity’s new International Convention Centre, and in Christchurch, recent work includes the tearing down of the old Calendar Girls building in Hereford Street. The damage caused by last November’s earthquake has also resulted in several high-profile demolition projects in Wellington – 61 Molesworth Street office block and Queensgate car park. “Demolition is a critical, but often ignored, component of large-scale commercial projects,” says Bayley’s National Director Commercial and Industrial John Church. “With construction ramping up across Auckland, and the Unitary Plan allowing greater density of developments, skilled demolition crews will be in high demand. engineers on site to ensure the structural integrity of adjacent structures. The aim of every project is to demolish safely, cleanly and on time – and to cause as little disruption as possible for neighbouring structures and to have minimal impact on traffic. Ward Demolition founder Peter Ward says the process of tearing down Downtown Shopping Centre was “incredibly technical”, and involved a large amount of stripping by hand to deal with the asbestos found in one of the structures. His crew had to be careful not to damage the two office towers that also occupy the block: the 17-storey Zurich House, which is home to NZX Auckland, and the 17-storey HSBC House. “We had connectivity and tremor issues. Wind was also a challenge. When we were removing a platform close to one of the neighbouring buildings, it would have taken just one gust to send the platform crashing into it, but we didn’t break a window. Ward says the first structure at Downtown that his team demolished was simple but the second was more challenging. “There was a lot of unexpected asbestos we had to remove. That part of the job showed the importance of surveys. You peel away a tile and you find more warts, more problems. We lost a lot of time because of the asbestos. “We had to change techniques. For the asbestos, we had to hand-strip the building – you can’t just send in the bobcats. But once we’d removed the asbestos, the rest of the structure came down easily. In the last phase, we cleared some real estate fast. Logistics can be a pressure point. On the Downtown job, Ward had 10 units on site daily and moved four loads daily. When Ward took down Auckland University’s 14-level science education building in 2014, the company had to remove more than 10,000 tonnes of material and truck access was restricted to a one-way single lane road. The biggest part of any demolition job is waste removal and recycling. Some demolition companies recycle up to 95 per cent of the building materials, with much of the concrete waste products used for driveway rocks and road underlay. Ward says his company’s capacity to recycle large volumes of waste both on and off-site was critical to helping the developers meet their construction targets. Almost all of the material from Downtown Shopping Centre – 90 percent – was recycled. “We try to salvage as much of the building as we can. All the windows, doors and toilets we took to our salvage yard. We recycled all the steel, aluminium and copper, and the mixed rubbish we gave to an outside recycling and waste services company.